Blowout Sale! 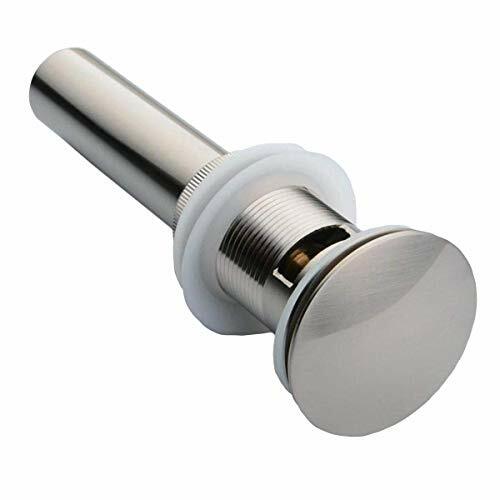 Save 68% on the Hiendure Bathroom Faucet Vessel Vanity Sink Pop up Drain Stopper with Overflow Brushed Nickel by Hiendure at Wakaf Center. MPN: FD802SL. Hurry! Limited time offer. Offer valid only while supplies last. Lavatory sink drain, precision manufactured by Hiendure. This drain is constructed from heavy, genuine stainless steel, and is exceptional quality. Lavatory sink drain, precision manufactured by Hiendure. This drain is constructed from heavy, genuine stainless steel, and is exceptional quality. This is a push-button style drain; simply press the top of the pop-up to close, and another press to open. Inside the drain is a very-smooth, spring-loaded mechanism that maintains a water-tight seal without the need for a leaky push-pull lever. This drain is "Overflow Style" for use with standard sinks and vanities that have an overflow hole at the top of the sink bowl. Drain is standard-size; designed to fit bathroom, vessel and wet bar sinks, or any sink with a drain hole from 1 1/2" to 2" in diameter (fits almost all sinks). The drain exit, or waste pipe, is standard 1 1/4" size, although these drains can also be used with 1 1/2" traps and a bushing.